I went to Bole the day before departure to file, found the airport people very friendly and helpful. I was a little unsure of my responsibilities in customs and immigration, but it seems I don’t have any. They don’t want to stamp my passport, only by asking can I get a stamped outbound Gen Dec. The fees are modest, and I was allowed out to check the plane (or I walked out and no one stopped me). It has about 140 gallons left, and doesn’t even need oil. 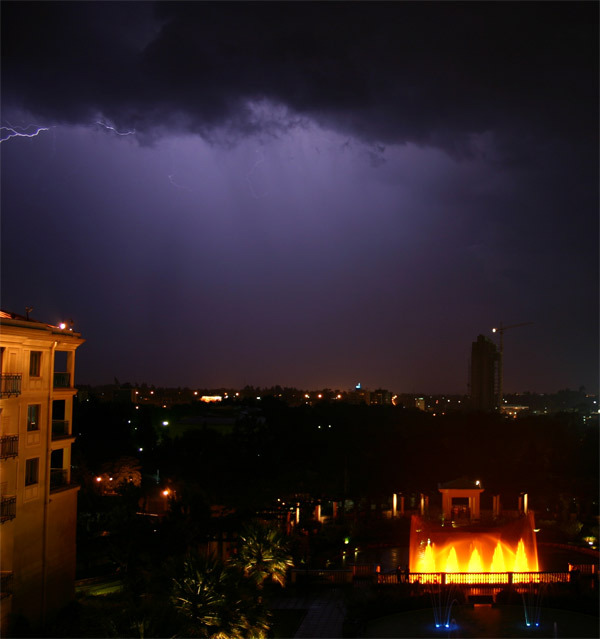 The last two nights in Addis had splendid thunderstorms, fun to watch, but the same weather is worrisome for Saturday morning. 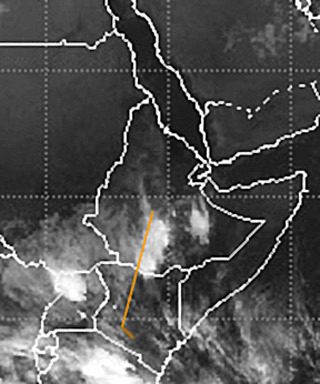 The satellite picture shows dense cloud cover for much of the trip. An expected tailwind helps, but I go to bed early thinking of clouds. I overslept, having checked the alarm enough times to turn it off. I get to the airport 30 minutes late, pick up my prepared met briefing, hand written with my tail number on it. Clouds at many levels, but Nairobi looks OK. Out to the plane, recheck everything. No water in the fuel despite hard rains. Loaded up and ready to go, I’m cleared to taxi for 7R. I inform them of limited performance, and get initially cleared up to 125 on course, but takeoff and climb are fine, entering clouds a few minutes after departure, and they clear me to 160 final with an mea of 150 and a sector clearance of 142. I’ve calculated the freezing level about sixty times now, and then confirm it is just below my cruising level. 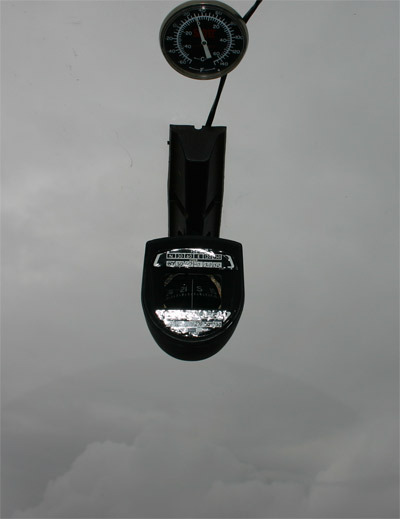 At 160, its about –2 C , and every time I go through light clouds, I pick up a little more ice. I ask for 150, and get it. I pick up ice, but then go through a big cumulonimbus, and the rising warmer air and hard rain remove some. My oxygen system makes a little noise on every inhalation, and I’m counting these, more than 40 a minute, and I need to relax. I have thoroughly considered going back, and have all my alternates in mind, but the situation remains rather the same. No major accumulation, good performance, so I continue. The stormscope shows activity consistent with the satellite picture, moving to the west. 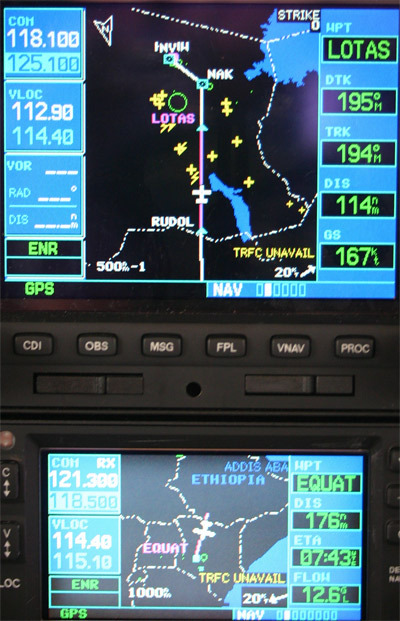 Addis told me to report RUDOL, the FIR boundary on HF, but no one talks back, no one can relay. I try back and forth between Addis and Nairobi on every HF and VHF frequency on the chart, but no answer for about 30 minutes. I’m trying to conserve my last half bottle of oxygen, and work on breathing slowly and efficiently. I also have the equator up ahead, and have to do something. 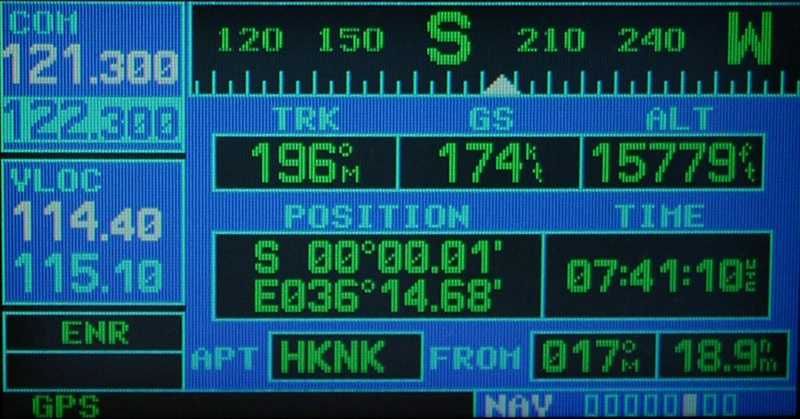 I set a waypoint up on course at the equator with an alarm so I won’t miss it, and eventually the time comes. As I pass it, I get a picture, but not much ceremony. I’ve gotten back in touch with Nairobi, good VHF reception, and am now flying through high Cbs, trying to go around the worst. I get one bump that rearranges everything, but not much else. I get a descent direct to Golf Golf, then cleared for the ILS for Jomo Kenyatta, and a side step over to Wilson in nice VFR, land and have a very easy time with customs. I fuel the plane, considering the weight, density altitude, distance to the Seychelles, along with the fact that gas here is one half the price in Mahe. Besides, they fill a jar and show you what you are getting without being asked. 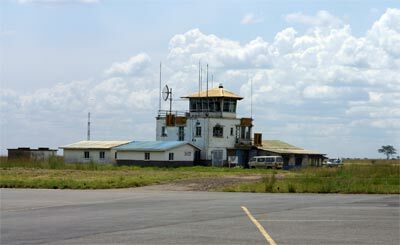 I taxi over to the Aero Club of East Africa, and push my plane into a slot between two 206’s with bush tires, baggage pods and HF antennas. They greet me by name at the front desk, and check me in to a nice room about 150 meters from my plane. 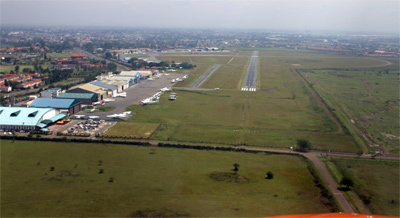 The four hour flight started early to beat afternoon weather in Nairobi. It is my shortest flight yet, but I am more worn out, sitting in my room, listening to it rain, than I was after the Atlantic. Satellite photo- have to flip vertical to match big screen shot. The storm to the east of line moved west as shown on stormscope display.